Today’s Final Jeopardy answer (in the category Special Days) and game statistics for the Wednesday, January 17, 2018 game between Lee Quinn, Amanda Griggs, and 5-day champion Gilbert Collins. Today’s Final Jeopardy answer (in the category Novels of the 1960s) and game statistics for the Tuesday, January 16, 2018 game between David Rosen, Olivia Ochoa, and 4-day champion Gilbert Collins. Today’s Final Jeopardy answer (in the category The Theater) and game statistics for the Monday, January 15, 2018 game between Tyler Miksanek, Steve Garbacz, and 3-day champion Gilbert Collins. 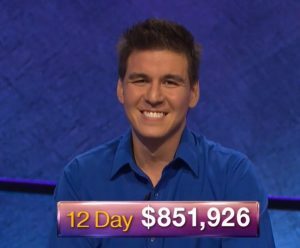 Gilbert Collins returns as Jeopardy! champion. See what 10 challengers join him here! Today’s Final Jeopardy answer (in the category African Countries) and game statistics for the Friday, January 12, 2018 game between Alisha Mathalikunnel, Alex Cook, and 2-day champion Gilbert Collins.